The Pyramid Butterflyfish (Hemitaurichthys polylepis) is just one of the many different species of Butterflyfish. This saltwater fish gets its name from the white pyramid shape on its midsection. This fish's head starts out yellow while it is young, but will turn brown as it matures. These fish can grow up to 7 inches (18cm) in length, and are found on the outer edge of reef systems where they feed on plankton. These fish are also called Yellow Zoster Butterfly or Yellow Pyramid Butterflyfish. 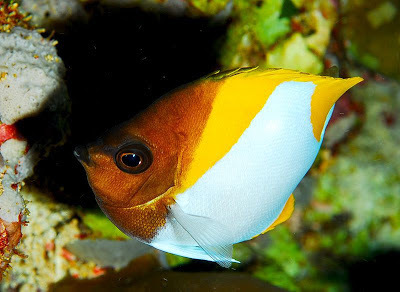 Pyramid Butterflyfish are often seen in schools, and are found in the Western and Central Pacific Oceans, as well as the Eastern Indian Oceans. 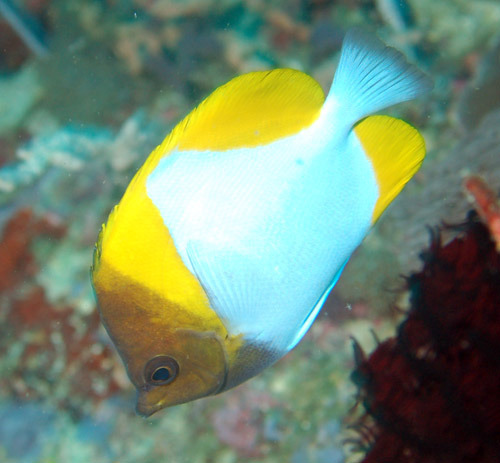 This fish can be kept in an aquarium, and is considered to be reef safe. They are easy to take care of, but require a large tank of at least 125 gallons. Like most other aquarium fish, providing them with plenty of hiding spaces is always a good idea to keep them happy. You can view the Pyramid Butterflyfish in it's natural environment in the underwater footage below. If you have any additional information or care tips for the Pyramid Butterflyfish please leave us a comment below.